This romantic camping tent is glamping at its finest and provides guests with a unique and comfortable experience near Rome in Italy. Inside, a romantic king-size bed with a mosquito net and a fridge for wine, drinks, and food. 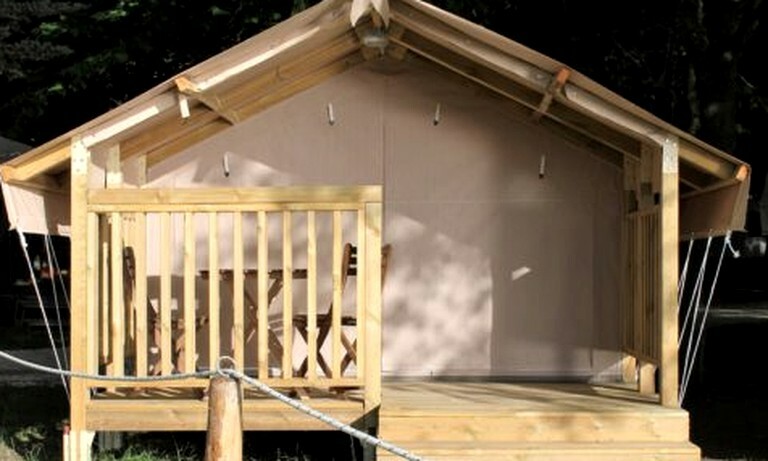 The mini lodges are located a few steps from the shore and are comprised of a bed area that opens onto the terrace that is shaded by the surrounding trees and furnished with all the necessary equipment to spend an extraordinary night under the stars. 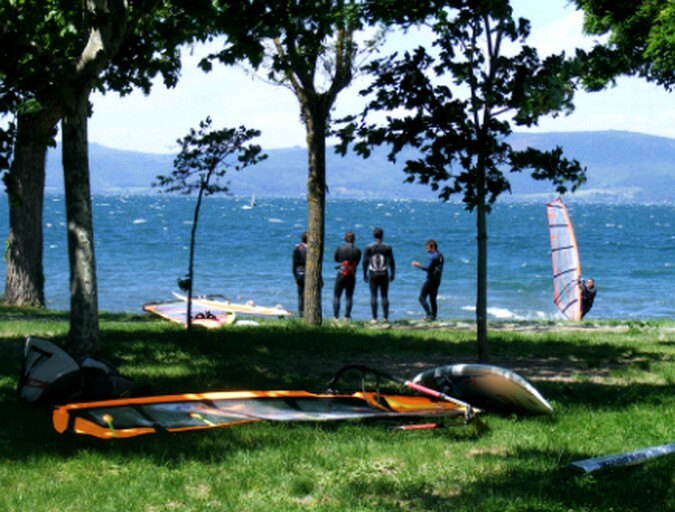 WiFi is available for two devices in this glamping site, as well as an on site barbecue for glampers to cook up a storm in the glorious Italian sunshine by the Lake Bracciano. The use of simple ingredients grown on the premises allows guests to discover the authentic flavors of the area. The on-site restaurant prepares dishes inspired by the local tradition with the addition of international options, to satisfy any culinary need. The menu is based on fresh pasta, local vegetables, grass-fed meat, and lake-caught fish and includes gluten-free options that must be reserved in advance. There is also a menu available for vegetarians. The pizzas are veritable delicacies and made only with organic flour and natural certified yeast. It is also possible to make reservations for dinners based on typical recipes of meat, fish or other culinary treats. The hosts design the menu with kids in mind: to make every dish not only tasty but also healthy. Every product offered in the restaurant comes directly from the producer. For those who want to explore Rome for a day or visit the surrounding areas, the hosts can prepare lunch boxes for glampers to take with them on their travels. Getting to know the local nature with its winds, waves, weather or simply the breeze, is not only a fascinating experience, but it makes guests appreciate the lake from a unique, captivating point of view. Travelers can enjoy the lake in all its marvels while experiencing fun and unique activities such as flying on water using only the wind as well as being advised of other activities by the expert trainer who will pass down his passion for water-based sports and, in a few sessions, teach glampers the basics to become familiar with the board or to improve their technique. For those who want to know how it feels to be transported by the wind, the qualified trainers will guide them on sailing boat day trips to discover the inlets of one of the most fascinating volcanic lakes in the Mediterranean. Glampers can also hike on dirt roads in woods, by orchards, on mountaintops, along the Tiber River, and on the private bike lane, silently. This is truly a non-conventional way to discover and conquer nature not to dominate it, but to enjoy it and be transformed by it. In Latium, glampers can also enjoy the adrenaline of mountain bike downhill rides. Trust in the guides and expert trainers. 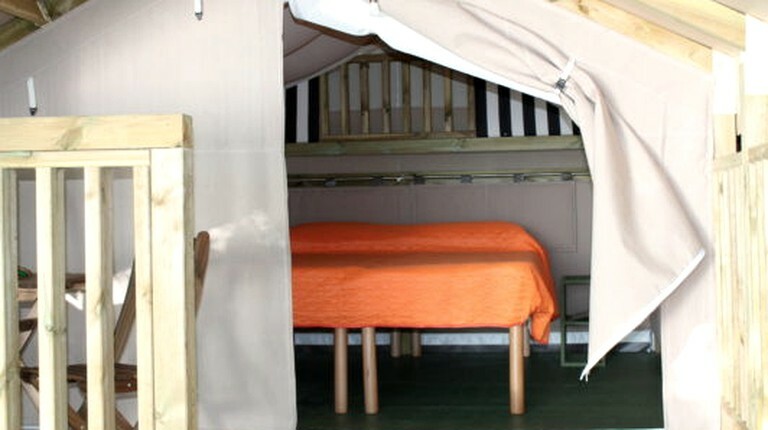 Guests are welcome to bring their own equipment or they can rent it at the glamping site. Those who seek movement, sweat and strong emotions will find every possible option at this unique and luxury glamping site.